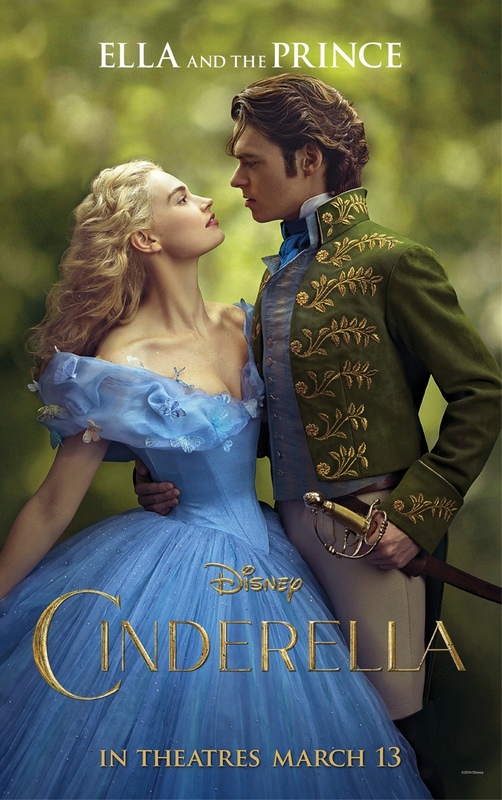 Many stories were told about the adventures of Cinderella, but with the latest offering from Walt Disney Pictures and produced by David Barron, Simon Kinberg and Allison Shearmur–it is one moving fairytale about the lead character named Ella or Cinderella portrayed by Lily James opposite Richard Madden as Prince ‘Kit’ Charming. The teaser poster of Cinderella 2015 movie. This 2015 American romantic fantasy film directed by Kenneth Branagh, from a screenplay written by Chris Weitz is reminiscent of the Disney’s 1950 animated musical film of the same name. It certainly borrowed elements from the mentioned film and is also inspired by the tale created by Charles Perrault with some references from the Brothers Grimm’s version. In the film, after Ella was left orphaned and was under the cruel guardianship of her evil stepmother Lady Tremaine, which breathed into by Cate Blanchett. Ella had no choice but to also serve the two stepsisters—Drizella (Sophie McShera) and Anastasia (Holliday Grainger), respectively. The former comfortable lifestyle of the lass has turned into a nightmare, but she still held on to her promise she made to her mom (Hayley Atwell) to ‘have courage and be kind’ and to her dad (Ben Chaplin) to stay in their ancestral home and take care of it. The moral of the story is—the good will always triumph in the end. Perhaps, Blanchett’s interpretation of the role is quite refreshing as an evil stepmother and could rival Meryll Streep’s Witch in ‘Into the Woods’. However, the one thing that the Filipino moviegoers would love about this Cinderella re-telling is its element of being melodramatic in a good way. Ella who suffered by the hands of Lady Tremaine displayed an admirable disposition until she met her fairy godmother played by Helena Bonham Carter (whom I would say I also adore here). She got rewarded after doing a good deed; she was able to attend to the Prince’s Ball and eventually met again with the man who captured her heart. Seeing Lily James as Cinderella reminded me of two equally gorgeous and queenly bearing personalities—one is Megan Young the first Filipina to become the Miss World in 2013 and Julia Abueva who assumed the character in Resorts World Manila’s production of ‘Cinderella’ in 2013. (L-R): Young was declared Miss World 2013 and Abueva alternated as Cinderella in Resorts World Manila’s production on ‘Cinderella’, also in the same year. James was perfect and moved with such ease and regal as Kit’s apple of the eyes. Many highlights in the film include the transformation of the pumpkin into a glittery coach, the lizards, the goose, and the mice to be her companion in heading to the ball in the Prince’s castle. The blue gown glimmered as well as the glass slippers that seems to create varied colors when Ella wore it. The choreography in the ball, particularly the dance of Cinderella and her Prince Charming was splendid and impeccable in its movement. Everything in the film—its cinematography, the detailed costumes, and sets were simply a delight and feast to the eyes for the moviegoers. Though the story has been told and re-told, one can still enjoy what this film can offer. ‘Cinderella’ opened on Friday the 13th of this month and is now showing in theaters nationwide. To know more about the film, click here! MANILA, Philippines – After the 20-year-old Jamie Herrell, a Cebuana who was recently crowned Miss Earth 2014 on Saturday, November 28; another Cebuana, a 24-year-old financial analyst, Kris Tiffany Janson almost bagged the title Miss Intercontinental 2014 when she placed second runner-up to Thailand’s Phataraporn Wang on Thursday night, December 4 at the Maritim Hotel Madgeburg in Germany. Kris Tiffany Janson almost bagged the title Miss Intercontinental 2014, but failed and settled to be named as second runner-up. Janson, came in third, but also brought home the Miss Photogenic award. She vied against other 71 contestants from around the globe to become a woman of power and grace, commitment and intelligence, style and substance. Cuba’s Jeslie Mergal was declared first runner-up. The Continental Queens were South Africa as Miss Intercontinental Africa, Philippines as Miss Intercontinental Asia & Oceana, England as Miss Intercontinental Europe, Cuba as Miss Intercontinental North America, and Argentina as Miss Intercontinental South America. Part of the Top six finalists were Miss Portugal and Miss Thailand after being declared tie with Miss Philippines for the Miss Intercontinental Asia & Oceana title. Countries who made it to the Top 16 semi-finalists were: Puerto Rico, Canada, Ecuador, Brazil, Myanmar, Mauritius, Nigeria, Poland, and Turkey. Special awards were also given to South Africa as Best in Swimsuit, Puerto Rico as Best in Evening Gown, Panama as Best in National Costume, Turkey as Miss Fashion and Style, and Canada as Miss congeniality. Currently, Kris is an entrepreneur and runs her business called the Mactan Dynamics Dance Company in Cebu. She was born and raised in Los Angeles, California USA on July 12, 1994. The Miss Intercontinental pageant is on its 43rd anniversary.